All you need for your film presence in Cannes brilliantly transported by road, sea, or air. 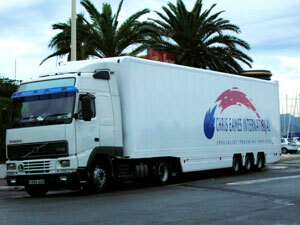 Chris Eames International has dispatched trucks to every major festival in Cannes for more than two decades, serving the film and music industries with fully managed transport and logistics services - for some of the most important events in either sector’s annual calendar. Exhibition stands are collected direct from the contractor, to travel safely in state-of-the-art air ride trailers for delivery straight to the exhibition hall. From office equipment and film, to promotional materials and personal baggage – everything you need while in Cannes can be collected from your home or office and delivered directly to your stand or to your hotel. Our experienced drivers and friendly local staff know Cannes and The Palais de Festival better than most. And reassuringly, they can be easily contacted for any help or support you need during your stay. There’s Cannes. And then there’s Cannes with Chris Eames International in your corner! We make a world of a difference.